Before the term ends at the end of the month, the Supreme Court is expected to deliver an opinion on Whole Woman's Health v. Hellerstedt, which will determine if laws restricting abortion access are actually serving the government's interests in promoting public health. The case out of Texas is, perhaps, one of the biggest abortion cases since Roe v. Wade. In conversations leading up to and after the decision, you'll probably hear a lot about TRAP laws. So what are TRAP laws? They have absolutely everything to do with the SCOTUS case. This whole SCOTUS battle began in 2013, when — despite Wendy Davis' valiant filibuster — the Texas legislature voted to pass HB2, an omnibus abortion bill, which was eventually signed into law by then-Gov. Rick Perry. The law, which supporters said would improve the safety of women seeking abortions, mandated that all abortion providers have hospital admitting privileges nearby, that abortion clinics have the same standards of an ambulatory surgical center, required a follow-up visit for women using the abortion pill, and restricted abortion after 20 weeks. HB2's series of regulations for abortion clinics — which are expensive to implement — caused facilities across the state to shutter, leaving thousands of women with little or no access to abortion providers. The lack of access for women sparked the case's two-year wind through the court system, which eventually was argued in front of SCOTUS in February. HB2 is what abortion activists call a TRAP (targeted regulation of abortion providers) law, or a measure that puts requirements on abortion providers that are not mandated for other medical professions. For example, requiring clinics to be on par with ambulatory surgical centers, which many view as an unnecessary precaution for an overwhelmingly safe procedure, would be considered a TRAP law, as would requiring providers to have admitting privileges to hospitals. 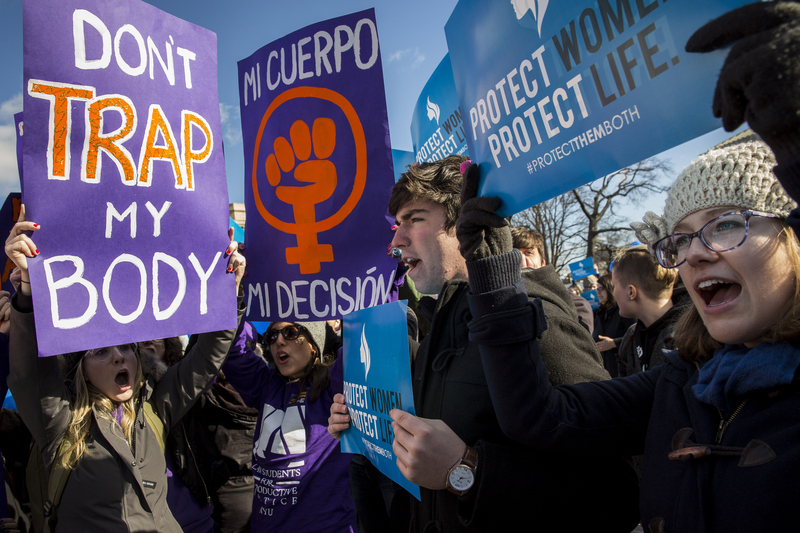 Activists view TRAP laws as an eerily effective way to limit abortion access without passing specific legislation to do so. Texas has been a prime example: Since HB2 was signed into law, 28 clinics have closed across the state, which is bigger than the entire country of France. Now, Texas is left with only eight clinics, which leaves women who aren't close to major urban centers with no access to abortion in their own state. SCOTUS' upcoming decision will have major ripple effects not only in Texas, but across the country. TRAP laws are bad news, so hopefully the Supreme Court doesn't let them stand.